5 things you need to know about the Hyundai Intrado, including the possible release date and engine specs! 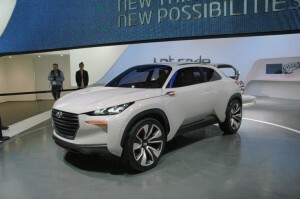 At the Geneva Motor Show, Hyundai has officially unveiled their new hydrogen-powered concept crossover, called Intrado. While concept vehicles are usually more of a design exercise, Hyundai are treating the Intrado as a demonstration of a small crossover vehicle that will be released to the market within 2 to 3 years. The eye-catching concept CUV is highly efficient thanks in large part to the addition of lightweight materials, innovative construction methods, and an advanced powertrain. Many of the materials and technologies used in the new Hyundai Intrado have been inspired by aircrafts. Among those are the removal of all unnecessary weight, as well as a purity of purpose, which is what is found in the advanced powertrain. The exterior shape of the vehicle is incredibly distinctive, and was put together with aerodynamics very much on mind. As such, there is minimal adornments and detailing to be found. Super-lightweight steel was used to construct the body panels, all of which were made at Hyundai’s own steel plant. The interior of the Hyundai Intrado concept is minimal in design, but has a level of adaptability and usability that is indeed uncommon. All opening panel seals close directly against the carbon fiber frame, allowing the carbon fiber to be put on display whenever the doors, hood, or trunk are opened. Another cool oddity is that components that are usually concealed are put on display via see-through air vents and an exposed frame where seats are directly clipped on. The use of lightweight materials really shows off the desire that Hyundai has to start creating cars that are lighter, stronger, and easer to drive and repair. New manufacturing and joining techniques were used to construct the central carbon frame structure, the design of which may eventually change how all cars are made. The central structure is strong and rigid enough to allow a variety of different materials to be used to construct the body panels, allowing much more freedom for designers. Repair times are also improved thanks to the use of lightweight steel. The Intrado gets its power from Hyundai’s next-generation hydrogen fuel-cell powertrain that features a Li-ion 36 kW battery, taking a matter of minutes to re-fuel. The driving range of the car clocks in at 600 km, and it emits nothing but water. The reduction in weight means that the Intrado will have improved driving dynamics, as well as being incredibly responsive. This is the first Hyundai vehicle styled under the watchful gaze of Peter Schreyer, who took over as President and Head Designer of the company last year. He believes that the Intrado crossover is an effortless and sensual vehicle, and one that will show how committed Hyundai are to delivering a joyful driving experience to all of their customers. The Intrado is the result of a collaboration between Hyundai Motor’s design and engineering teams in Europe and Namyang, Korea. Much of the styling was performed at the European R&D Center in Russelsheim, Germany, which is where the HED-9 (Hyundai Europe Design-9) codename comes from. Hyundai also partnered with a pair of well-known carbon fiber producers for many of the parts in the car. Lotte Chemical and Hyosung were the two companies involved in delivering the carbon fiber that helps make up the unique look and superior strength displayed by the Hyundai Intrado. 5. Hyundai Intrado release date? The question is when is Hyundai going to launch the production-ready Intrado small SUV? Some sources state that Hyundai Intrado could hit the dealership stores in late 2017.